A large banner reading “Defeat Hillary, Vote Trump!” expressed the sentiments of many of the several hundred people who attended Hawaii’s Republican state convention Saturday at the Filipino Community Center’s Casamina Flores Ballroom in Waipahu. But not every local Republican backs the New York businessman-turned-politician, and that led to turmoil when state Rep. Beth Fukumoto Chang took the stage. As House minority leader, Fukumoto Chang was scheduled to deliver a report on the recently concluded legislative session. Instead, she opened up the room to questions, knowing full well what the questions might be: Does she support Trump? And is she really a Republican? 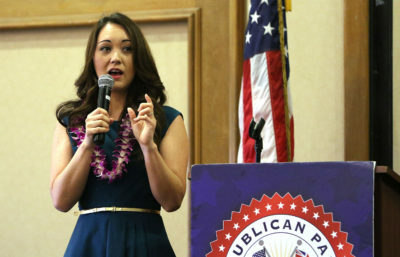 Rep. Beth Fukumoto Chang was shouted down by some party members for her views on Donald Trump and working with Democrats. Fukumoto Chang said she is worried about what she considers racist and sexist remarks made by Trump, even though she said she doesn’t think all his supporters held such views. She said it was probable that some supporters of Hillary Clinton were racist and sexist. As for her brand of Republicanism, Fukumoto Chang said it was important for her party to “use a different tone and sound like we are from Hawaii” in order to succeed here. She defended working with Democrats who control the state Legislature. Maintaining the status quo, she argued, is not what voters want. “Hawaii is not Texas, and we are never going to be,” she said. To rousing cheers, Rep. Sam Slom said that is it the duty of Republicans to challenge Democrats. A half dozen or so Republicans took to floor microphones to express disappointment that Fukumoto Chang was not supporting Trump, even though he won the state party’s caucus in March. The more Fukumoto Chang tried to explain her views, the angrier and louder some audience members got. Still another said Fukumoto Chang should switch to the Democratic Party, as did her predecessor as House minority leader, Aaron Ling Johanson, just two years ago. Party Chair Fritz Rohlfing intervened to stop the ruckus. Afterwards, some Republicans said to one another that they could not recall such a brouhaha at any recent GOP state convention. Others argued that it was essential for the party to unite behind their party’s presidential candidate. Sam Slom, the only Republican in the state Senate, gave a rousing speech insisting Republicans have to “take it to the Democrats,” who have had 60 years to improve education, transportation, the economy and the cost of living. Hawaii has only eight Republicans in its 76-member Legislature and none in Congress. Since 1959, Republicans have only occupied the governor’s office for 11 years and sent only three members to Washington. That’s in considerable contrast to the national picture, where the GOP controls a majority of governorships, state houses and both chambers of Congress. 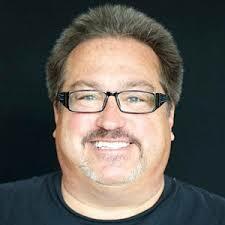 Party Chair Fritz Rohlfing worked to move convention business along and to call out attendees when they were out of order. Rohlfing is well aware of the need to expand the base. 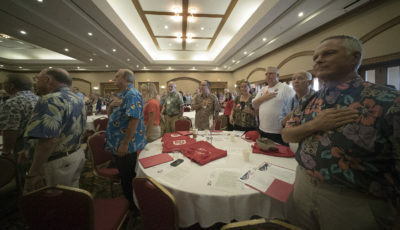 The selection of Waipahu as the location for the biennial convention was, he said, in recognition that West Oahu has been voting Republican in growing numbers. Building off a presidential caucus where turnout increased by 50 percent over 2012, the party is looking to increased the number of registered members, currently about 33,000. 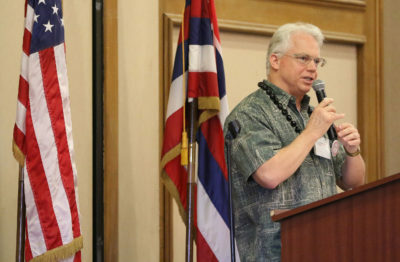 Andrew Walden, who was honored Saturday as the party’s volunteer of the year, pointed out that 33,000 is more than the combined membership of the United Public Workers and Hawaii State Teachers Association — Democratic-leaning labor unions. 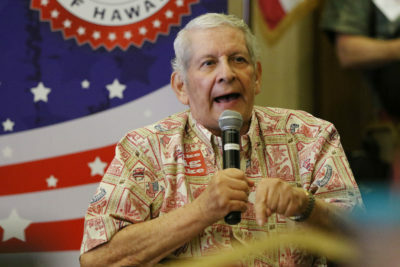 The convention’s keynote speaker, Robert Graham, chair of the Arizona Republican Party, urged Hawaii Republicans to celebrate the differences of opinion in the party but to then shake off any ill feelings if their candidate didn’t survive the presidential primary season. 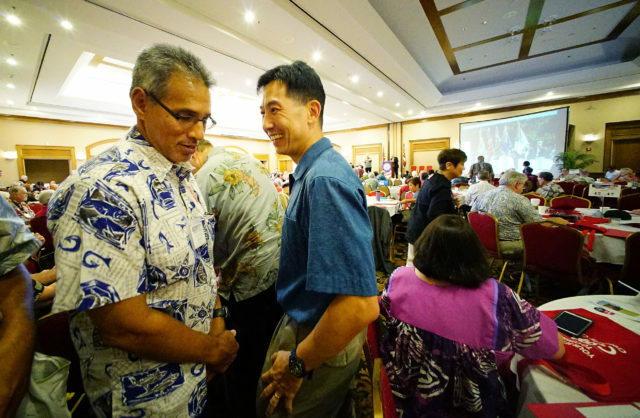 Duke Aiona, left, and Charles Djou chat during the GOP convention. Each is said to be weighing running for elective office this year. Across the country, Graham said, supporters of Ted Cruz, Marco Rubio, John Kasich, Jeb Bush and other failed presidential candidates are moving to support Trump. As Rohlfing reminded the audience, Democrats took over the Territorial House of Representatives in 1954 — in what is known to Dems as “the revolution” — but Republicans held the Territorial Senate until 1962. He also noted that Ronald Reagan won Hawaii in his 1984 bid for re-election. Rohlfing shared slides showing where Hawaii Gov. David Ige, a Democrat, did well in the 2014 election and where he did not. In Rohlfing’s view, the latter represents areas of promise for Republicans this year and in future elections. The convention included an extended debate over adopting a platform resolution addressing public facilities and transgender people. The resolution was in response to President Barack Obama’s order earlier this month mandating that all public schools allow transgender students to use the bathroom that matches their gender identity, or else a school could risk losing federal funds. 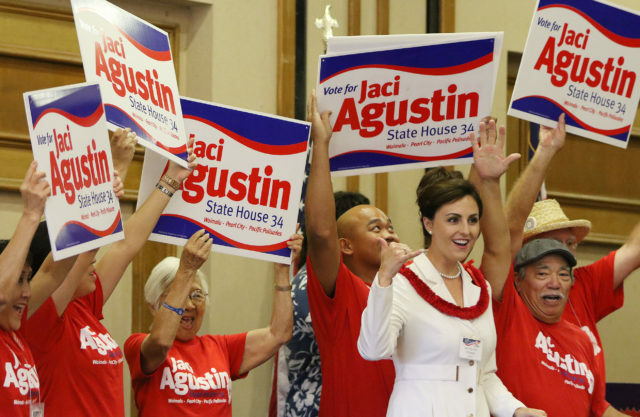 State House candidate Jaci Agustin during the convention’s parade of candidates. Under such a presidential directive, Moses argued that the privacy of women and children would be at risk. But other Republicans, such as former legislator Barbara Marumoto, pointed out that Trump himself said people should just use the bathroom they are comfortable with. Others argued that agreeing to such a resolution would only provide Democrats fodder to argue that Republicans are intolerant. The resolution, which was amended slightly, passed, although there was some confusion about the final language. A party spokesperson said the approved resolutions would be posted on the party’s website within a week. Hawaii Democrats, who will hold their state convention May 28-29 at the Sheraton Waikiki, have their own pronounced divisions, of course. And, unlike Republicans who are mostly coalescing around Trump, Democrats still have not completely decided on their presidential standard-bearer — Hillary Clinton, the frontrunner, or Bernie Sanders, who is not throwing in the towel.